In Apulia there is a beautiful city, known as Alberobello; it lies in the province of Bari in the south-east of Italy. 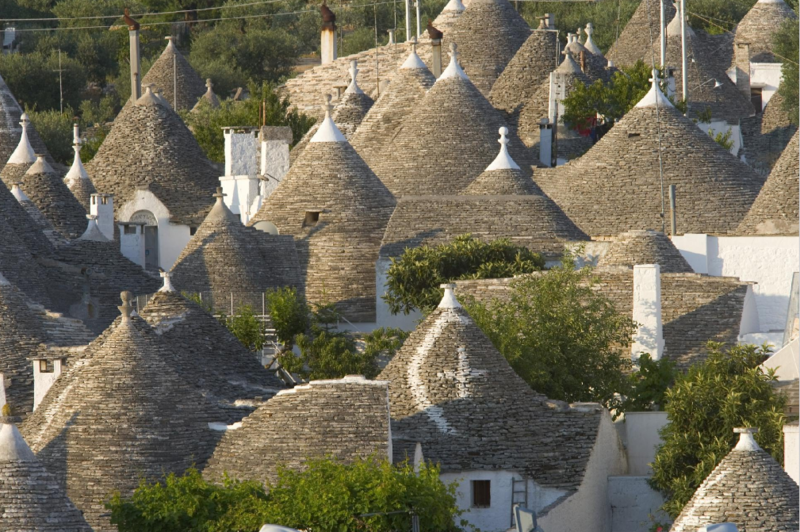 It is very famous for its cone-roofed houses called “trulli” that you can find especially in the Valley of Itria and in the provinces of Taranto, Bari and Brindisi since the Bronze Age. This place is one of the 50 World Heritage Sites of Unesco because it is an example of ancient Italian architecture. It has a particular structure: a round form with a pyramidal roof made of white and grey stones, wooden doors and windows without any element of support. The interior is composed of a unique room and the keystone of the roof is decorated with spiritual or propitiatory characters. This type of house is still in use today because it ensures a thermic equilibrium due to the scarsity of windows: in winter it is warm and in summer it is cool. Pietra: stone, a piece of rock which can be used for building a lot of constructions (houses, bridges…). You can also find this word in an Italian expression “avere il cuore di pietra” (to have a heart of stone) when you speaks about a person that is cruel and unfriendly with other people.